The majority of dogs in BROOD's care come from animal shelters or other rescues. At times BROOD is able to accept owner-surrendered bassets and basset mixes into our adoption program. After contacting us, we will interview you to obtain ownership, medical, behavioral and background information about your dog from you and your veterinarian. 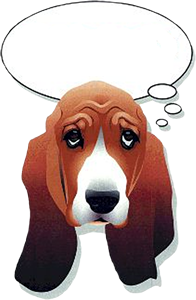 Once we have the information we need, we will make a determination regarding your dog. BROOD cannot accept a dog that has a history of aggression or biting. You need to consult your veterinarian to rule out any medical problems causing the behavior and determine a medical treatment plan. You may also need to contact a professional behaviorist to address your dog’s behavioral issues. If your dog has a serious, untreatable or terminal health issue, please do not attempt to surrender your dog to BROOD. Instead consult your veterinarian and choose a plan of action that will best address your dog's quality of life. This may include euthanizing your dog. Uprooting a sick or very old dog from its lifetime home and surrendering it to a rescue is very traumatic to the dog. When you decide to own and love a dog, it's for life. You are responsible for that dog and to "do right" by it, including making end-of-life decisions. If your dog is accepted into BROOD's adoption program, you will need to provide copies of all vet records, any paperwork available on the dog (AKC certificate, breeder information etc.). Your dog should be up to date on vaccines prior to surrendering, and any and all medications need to be turned over with the dog. The dog will be evaluated, placed in a foster home and made available to our thoroughly screened group of approved adopters. Our goal is to match the dog with the best adoptive home possible. Dogs surrendered to BROOD will not be returned to the owner once surrendered. Due to privacy concerns, BROOD is unable to release any information about our foster homes or adopters. Contact us by to find out more information about our owner surrender program. Include your name, address, telephone numbers and basic information about your dog and situation. A BROOD representative will contact you. Please note that the surrender process takes time and we are unable to immediately take a dog into our care. The timing of surrendering a dog is affected by how many openings we have in our foster homes and the availability of our volunteers. If you purchased your dog from a breeder, contact that breeder. Reputable breeders will take a dog back at any time for any reason! If you adopted your dog from a rescue (other than BROOD) contact that rescue directly. Contact your veterinarian – they often have clients looking for a specific breed. Notify your local shelter or humane society – they will often have a waiting list and may be willing to work with you rather than have you turn your dog over to them. Look for a no-kill shelter or refuge in your area. DO NOT put an ad in the paper or on online bulletin boards. DO NOT list your dog on Craig's List or other such online lists. Bassets are often used as bait in dog fighting rings and the people who run these rings often watch such lists looking for bait dogs.